Why Is NEST Holiday Our Favorite Year After Year? The NEST Classic Holiday Candle is not only a perfect holiday season gift, with its exquisite flocked red and gold foil gift box (no ribbons or bows needed), but it is one candle you definitely do not want to go without this season. In it’s pretty classic NEST decorated glass, essence of pomegranate, Mandarin orange, pine, clove and cinnamon blend lusciously into vanilla and amber to add that splash of elegance and set the holiday mood. I love this candle! It has the essence of pine, reminding me that it won’t be too long to get out the vintage ornament collection, however, this isn’t just a “Christmas Tree” scented candle. 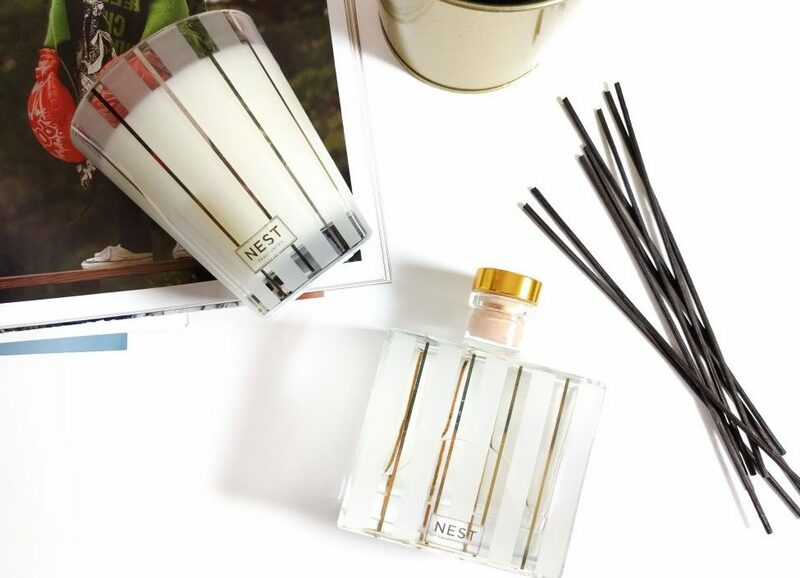 NEST Holiday has a bit of juicy fruit with pomegranate and Mandarin, a dash of spice and a lovely deep rich amber and vanilla base that all come together to partner exquisitely with the pine. Personally, I get a slight ember note in the background that makes this candle encompass all that an evening during the holiday season means to me, it’s nostalgic, romantic and cozy. If you have never tried a NEST fragrance, Holiday is an excellent one to start your NEST addiction. I’ve been burning Holiday and Sparkling Cassis over the past week and am in love with both. Sparkling Cassis is pink champagne (duh, no wonder I love it), crème de cassis, frosted cranberry and wild fig. I have it on my kitchen counter and every time I walk by I think “what smells so good?” and then I see the pretty glass sitting there. You see, I do perfumery for many candle and perfume brands, so my kitchen cupboards are filled with perfumery supplies, candle fragrances, and loads of candles, so for a fragrance to stand out in my home, it has to be pretty spectacular! Birchwood Pine: The aroma of a majestic winter forest is created by blending white pine, fir balsam and Birchwood over a base of rich musk and amber. Hearth: The aroma of a wintertime fire is created by combining rich oud wood with frankincense and hints of smoky embers. Get a festive perspective with a little something celebratory, a little something nostalgic, and a little something glam. Nest Fragrances' limited edition Festive Votive Trio is perfectly sized in the season's most festive scents - Holiday, Birchwood Pine and Sparkling Cassis. 2oz each. 20 hour burn time each.